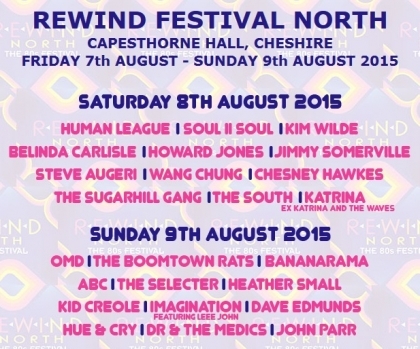 This August, Rewind The 80s Music Festival comes to the North of England for the second consecutive year! "Rewind North" returns in full force in the beautiful surroundings of Capethorne Hall, situated between Maccesfield and Wilmslow, Cheshire. The second Rewind North 80s Music Festival offers true connoisseurs of 80s music the best two-day line-up of iconic 80s recording artists and performers. Headliners include Human League and OMD, plus a stellar line-up including The Boomtown Rats, Jimmy Somerville, Heather Small, Wang Chung, Bananarama, ABC, The Sugarhill Gang, Belinda Carlisle, Kim Wilde, Soul II Soul, Dave Edmunds, Imagination ft. Leee John, Kid Creole, Howard Jones, The Selecter, John Parr, Dr & The Medics and many more, plus making his Rewind North debut - the one and only Chesney Hawkes! In addition to music entertainment, the festival will also feature plenty of fun-filled side attractions including the Silent Disco, Live Karaoke Bar, Funfair, Posh Nosh, Theme Bars, plus Camping and Glamping (aka Glamorous Camping) options. Other festival attractions include The Silent Disco - a fun-filled, innovative and highly entertaining way to party! They provide everyone with a set of headphones and have two DJs spinning the tunes simultaneously on two separate channels, leaving you to flick between them and listen to the music you want to throw your best shapes to!